My understanding of civic engagement is a rigorous one. I hold my views for reasons that cross traditional divisions of academia. First is a base in the current science of our relations to nature, and an unwillingness to engage in wishful thinking about what it suggests. Second are concepts from the social-sciences (especially psychology) that describe and help explain how humans think, feel, act and decide. The third major set of influences comes from extending traditions of ethical reflection and inquiry to our present and future relations with the earth's living systems. I cannot claim to be an expert in any but a small part of this span, but all are encompassed in my coursework and teaching and together they address our whole situation and our wholeness as persons. Although I participate in and deeply respect traditional disciplinary inquiry, I also believe that intellectual inquiry and practical action must start from a sampling that re-unites the usual divisions of life as re-presented by the university. To do less would be to avoid the responsibility placed upon the one institution of society dedicated to seeking the truth. Teaching civic engagement at the college level is a sort of last-ditch opportunity. Few students come well-versed in it, yet its demands are great and urgent. To be frank, the education system of any democracy deserving of that name would never occur primarily in isolated classrooms. From the earliest ages, learning would take place in and through engagement, and schools would internally model to the utmost possible extent civic involvement: students being coached and empowered to make decisions about their schools, their education, and their world. Mind you, I have the highest respect for the teachers that work within our schools, and believe that important steps in the right direction for teacher education have been made in recent years. The system we have is highly constrained by political, financial and social expectations. The world is, hopefully for the better, committed to democracy at this historical period, so we must learn to do it as well as possible. Spring Block (2011) "Graduation Ceremony"
Nonetheless, our school system is the result of a mass-production mentality that co-evolved with industrialism, population increases, and the fragmentation and bureaucratization of many components of social and moral life. I hasten to add that I don't necessarily think things were better at any period in the past; the problems were different, and perhaps even less hopeful depending on the vision of human life that may have prevailed. Today's dominant vision of human life, although it very understandably evolved from the (partly) good intentions of people in the past, is embodied in institutions and habits of the mind and heart that are now no longer either nourishing nor sustainable with regards to the biosphere nor authentic human flourishing. Unfortunately, most of our university students prior socialization and life experience have not challenged but rather reinforced dreams of satisfaction and fulfillment through participation in a civically passive consumption and disposal economy. Today our North American way of life proceeds with the implicit expectation that there is no reason to withhold meeting our every material desire through consumption that diminishes the welfare of people in other places, and future generations. Some students are inclined to defend this taken-for-granted social reality, but many are also aware that there are problems, not only including the relationship to our sustaining biosphere but also tensions with other important social goals such as economic welfare and social justice. Their awareness reflects the fact that our society is part way into a transition that, if it is not too conflictual and hesitating, may yet provide adequately for future generations. The 11 dimensions of the social foundation are illustrative and are based on governments' priorities for Rio+20. The nine dimensions of the environmental ceiling are based on the planetary boundaries set out by Rockstrom et al. (2009). Beyond the boundary: The inner green shading represents the proposed safe operating space for nine planetary systems. The red wedges represent an estimate of the current position for each variable. The boundaries in three systems (rate of biodiversity loss, climate change and human interference with the nitrogen cycle), have already been exceeded. Rockström et al. (2009). This all may be read as gloomy social/ environmental critique, a reading mirroring socially constructed defenses against the threat it seems to imply for our individual and collective identities. But it is necessary to move through this to find the place where civic engagement may be re-defined in adequate ways. Before I move there, however, to counter the easy dismissal of the perspective, I will provide a brief summary of studies that suggest just some of the problems we face. Climate Destabilization. First in public awareness is probably climate destabilization. The conservative projections of climate scientists have already been exceeded, and if the proven reserves of fossil fuel companies were all combusted, we would exceed by a factor of 5 or 6 the amount of additional carbon we can add to the atmosphere by 2050 and stay within the 2 degree Celsius temperature increase over pre-industrial levels deemed safe. 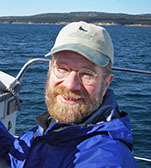 Ocean acidification, possibly leading to collapse of entire oceanic food webs, is one probable result, as well as intensified storms and droughts. Nitrogen Cycles. Less prominent are our effects on the nitrogen and phosphorus cycles. We have doubled the amount of nitrogen cycling in the biosphere via industrial conversion of inert atmospheric N2 to biologically active forms; the excess is fueling oceanic dead zones among other effects. Phosphorus Cycles. Phosphorus is an essential and non-substitutable nutrient in crop and human growth, and we have been providing it by mining the easily accessed concentrated deposits. Unfortunately whereas traditional agriculture cycled phosphorus back into fields (once in terrestrial biological systems, a given atom of P may be used for up to 200 years before being lost to a sink), now it has a linear one-way ticket to the ocean sink, after the sewage treatment plant. Future generations, perhaps lacking abundant cheap energy and rich P geological deposits, may be faced with a severe nutrition problem. Extinction Rates. Finally, estimates are that we are far beyond natural background extinction rates of living species, with unknown consequences for ecosystem services. These are only four of the 9 safe planetary operating boundaries (Rockstrom et al., 2009) we need to observe. Unfortunately, the notion that we can fix problems of these sorts and magnitudes entirely via technology are probably misplaced. Even cheap and clean solar energy may have unintended consequences such as enabling massive increases in energy use, material consumption and ecosystem conversion. No doubt such actions will help, but at the rates of current technology innovation and replacement, and at the rates of increased consumption evident in large countries such as India and China, we should not depend on them. The above trends are driven by our institutions and behaviors that seem to assume our every material desire can be met, and that future generations have no claim against such present consumption. But meeting every material desire is not even healthy for us. A growing body of psychological research reveals that the consumer society not only does poorly at meeting basic human needs (indeed, it stimulates unnecessary consumption by tying it to these basic needs), but worse, it actually works against human fulfillment. A focus on wealth, status, and image lowers self-esteem, self-actualization, and life satisfaction. It maintains feelings of insecurity and a need for praise, and leads people to overestimate the value of material possessions and the qualities of wealthy people. Even if wealth is highly attained, it predicts lower subjective well-being and long-term happiness. Materialistic values divert attention from directly meeting esteem and competence needs, interfere with quality relationships, and negatively correlate with authenticity, curiosity, independent thought, choice of ones own goals, and creativity. Negative relations are also found to benevolence and universalistic values (Kasser, 2002). As a system of social goals, material consumption ratchets upwards, increasing the baseline expectations for monetary income and happiness. We humans are averse to what we see as losses so it becomes harder to de-escalate consumerism once it is predominant. This only indicates how our present life style may work against enlightened self-interest, without visiting the social justice dimensions which are equally problematic. See Raworths (2012) response to Rockstrm et al: a safe and just operating space for humanity. So this sets the stage for a very demanding reconceptualization of what civic engagement should mean. So demanding, in fact, that no one is likely to live up to it entirely--the same as the societal challenges we face. Some might argue that because it may be unattainable, or because we may not see the results we want, the attempt lacks validity. But this gets the question wrong, I would respond. It is not a question of results but of doing the right thing, and of being the kind of person we wish to be, and of enacting or furthering the kind of education and world we can be proud of whether we succeed or not. In short, we need high ideals to stay on course with these challenges, educational and other. While embracing an ideal, we must also be psychologically realistic. The psychologically real what people are like, how they work is not only what we observe now about people, but what humans are capable of, given nourishing developmental and educational conditions. Thus my title, the care and feeding refers to the fact that our students are not blank slates; they have their natural grain and requirements. But neither can we treat them uniformly like a monocrop and expect a high yield. If we stick with a botanical metaphor, our learners may be a little like different species, some requiring exacting conditions specific challenges and supports. Plants also make their own environments, and this is true of our students: they are active learners. These qualities (without their own complexities) provide an important larger lesson these are the very human capacities that define flourishing in a robust sense, beyond narrow dreams of wealth, power, and self aggrandizement. If students learn these lessons experientially, and learn that they matter, and how to facilitate them, we have an attractive vision of flourishing that might fit joyously within our earthly home. Maybe it's a long shot on both counts, but it is one that will be fulfilling regardless of the outcome, and thus worthy of our best efforts. Starting with the learner, individuals construct their understandings of the world by interacting with it and with others. The others are essential for the traditional notion of civic engagement. My understanding of social psychology suggests others are essential to the very constitution of not only identity, but more deeply, of the self. But beyond that even, my research shows that the formation of the human self occurs through interaction with other living things. We form our ethical attitudes in reference to others through realization of shared and valued qualities. Shared qualities lead to a sense of group belonging a belonging that may be as narrow as a small group of like-minded people or as broad as all living things. But partly because of that potential narrowness and because of our tendency to favor the emotionally comfortable, and cognitively familiar or known, our sense of self usually cannot grow without confrontation with ways of life and ideas that are new, counter-intuitive, alien, or even opposed to us. It is through both kinds of influences, shared and other, as well as self-reflection, that the ethical develops. The land ethic simply enlarges the boundaries of the community to include soils, waters, plants, and animals, or collectively: the land. In short, a land ethic changes the role of Homo sapiens from conqueror of the land-community to plain member and citizen of it. It implies respect for his fellow-members, and also respect for the community as such. One useful tool is the arts presenting students with art, poetry, or music to provide a centering focus. In one recent class, I followed the example of an educator described in Palmer and Zajoncs book, The Heart of Higher Education, and started each day by playing a 3-5 minute music piece (reproduced; Im not a musician). Although this might suggest sentimentality, I have little patience for that. Rather I see this as serious business. George Herbert Mead, the great social psychologist, felt that ethical choice and action were possible when the person could represent internally every perspective in the situation. Today that means not only human others but nature's perspectives too. If students are to appreciate and tap our nature as denizens, it will take some conscious attention. Much of my research and writing in Conservation Psychology has concerned demonstrating that non-human nature is more fundamentally important to human development and experience than our culture typically tells us. Thus, students benefit intellectually by learning the sources of interest in and concern for nature in Western history (as well as learning how we got to our present dilemmas; the past continues to condition the present in the form of institutions and habits). For environmentally concerned students, understanding the origins and continuity of their ethical sentiments both affirms them and provides critical distance, making it possible to stand back and appreciate how others (and other cultures or sub-cultures) frame nature differently. Similarly, students benefit by even-handed examination of both anthropocentric and non-anthropocentric systems of ethics. I find there is a lot of room for productive disagreement among our students on this score. Some ways of being biocentric can prove highly alienating, as I illustrate by reference to the Lorax's failed attempts to persuade the Oncler in the famous Dr. Suess book (which is nonetheless often accepted as near-scripture by some students). We also put our students in direct and sympathetic contact with nature through the study and sharing of natural history both discrete topics, more synoptic reading the landscape, and creative expressions via drawing and writing. I dislocate their usual attitudes with variation on a classic environmental education activity that I call "earth potatoes" (a friend buries them with a little fallen vegetation then leaves them to experience the couch-potato-like--but here fruitful--passivity and dependence of their relation to the earth). 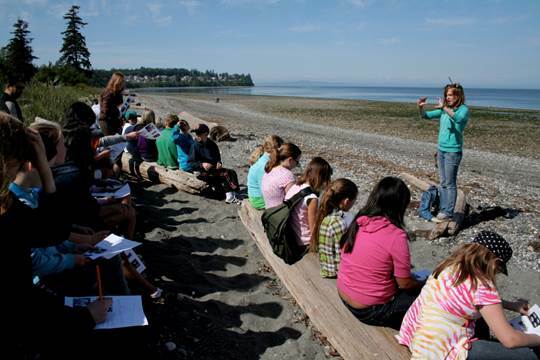 For environmental education students, we coach them on using the place to teach their own learners. 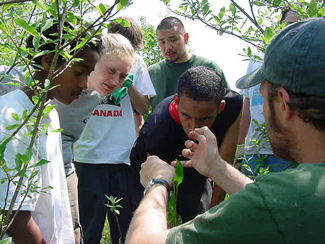 These activities are supported by relating their own autobiographies to research on the development of environmental concern, and the history of connecting children to nature, a recurrent cultural theme since the writings of Rousseau (with peaks in the Progressive era and in the last decade). Nature is arguably the original setting of learning since early human emergence. While my students connection to nature needs affirmation, again keeping in mind G.H. Mead's idea, their connection to other people across differences in philosophy and worldview is equally essential to their intellectual and ethical development, and often more challenging for them. A dozen years ago in one course I developed about nine different alter egos, or dramatis person as it were, most of them historical figures, to engage my students with different perspectives. Sometimes students are too courteous with guest speakers and can engage in playful argument with me more easily. But I gave that up, finding that real live speakers had far more impact. out-of-class assignments to bring student assumptions into creative tension with the world around them. their view of their own personal values. See a collection of Responses to Guest Speaker. With fortuitous timing, the Council decided the matter the last week of the term, and our former guest speaker's intent to sue over the choice was included in the coverage, leading to more reflection on public process. Although this 45-student class was too large for field trips, students got credit for researching, conducting and reporting on their own watershed or town tours, and talking to locals on the way. The latter project is only the most recent one in a multi-year school grounds enhancement effort at that school, where I have often involved my students, since 2005. One of the key tenets and practices on which I coach these students is, not surprisingly, respecting and highlighting the elementary school students voices and position as primary stakeholders of the school grounds. 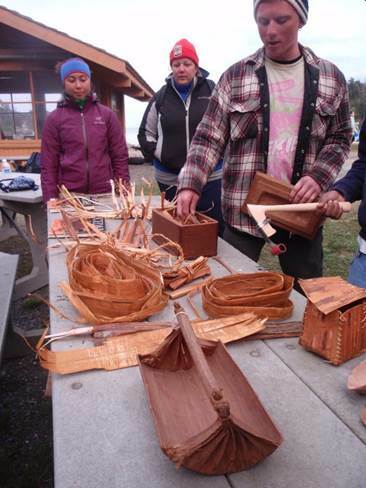 One of the most moving examples of service I have facilitated was really a cultural exchange. A former student, Mark Manuel, worked for several years as youth program leader for Seattle Housing Authority locations (High Point and New Holly). From 1999 to 2006 (when he was employed by Overlake School as Director of Diversity), at least once a year I would take my students to south Seattle, and he would bring his youth group composed of highly diverse immigrant kids and former gang members to WWU. For both groups, it was transport to a different world. Service was always involved, but the real learning was simply in working together, eating together, talking, and exploring new views on the world and life skills. 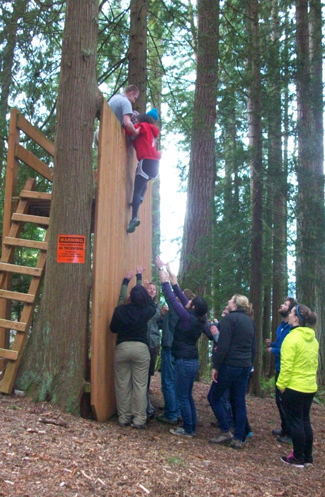 See Bellingham School District “Promise Award” for Volunteers of the Year. Empowering students to get behind the scenes, learn, and take the lead in civic engagement. Carrying service a step further, putting students in charge of designing and carrying out projects within our communities can powerfully affirm their sense of agency or self-efficacy. When this takes place within a setting that they feel “ownership” of, and students learn how that setting really works, contextual understanding, empowerment, meaning, and identity are all promoted. We are social creatures; belongingness has long been recognized as a basic human need. Most certainly many positive emotions spring from relationships with other people, and belongingness does not stop there. I think it is partly our social nature that helps us find our place as denizens in a wider ecology of subjects, too. Keeping in mind that community identity can suffer the pitfall of exclusivity, when we nurture a strong community for students they are most likely to grow and thrive as learners. 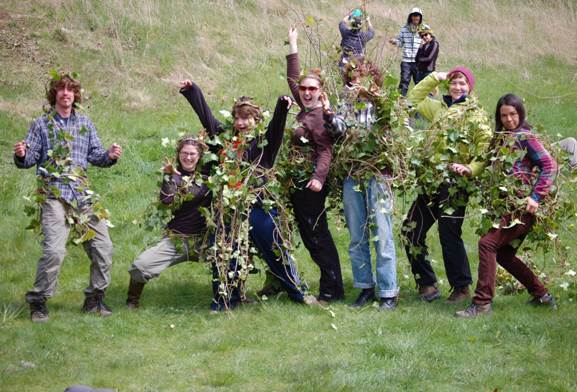 Huxleys spring environmental education field practicum, the Spring Block (SB) exemplifies community. Started by founding (and current) Huxley faculty member John Miles, SB is a set of four linked courses (17 credits) with the same instructors and students so we have complete leeway with scheduling. 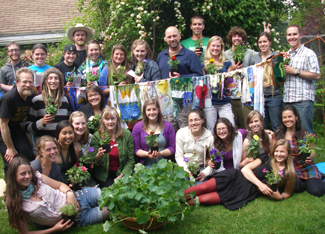 Based on a thoroughly experiential vision of education, SB is in its 34th consecutive annual offering this spring (2013). Many of those years owe their success to Miles and my colleague Wendy Walker, who plays a major role in SB and from whom I have learned a tremendous amount about student learning. With 20 students (not all of them Environmental Education majors), two faculty, and usually four undergraduate interns who know the ropes, we are able to venture far from campus and typically spend over 25 days in the field. We begin developing community in a preparatory seminar in winter quarter and continue to build it all spring as we recombine the students in different project groups. 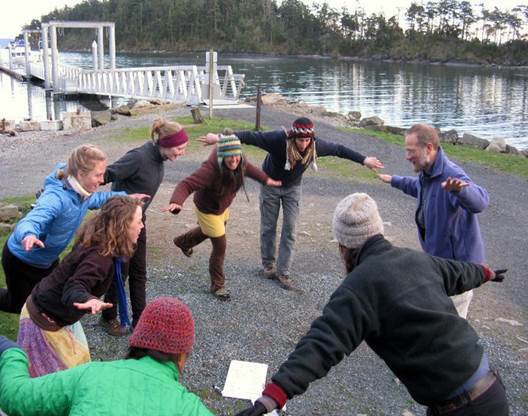 Having this sense of community builds positive relationships and emotions, provides support for the challenges of designing and delivering outdoor education experiences for younger learners, and givesgives an experiential basis for examining teaching and learning, group dynamics and communication. In line with Leopold's insights about expanding the boundary of the community, our Spring Block stresses connection to, and respect for, the land. In the environmental education context this means using the place to do the teaching. 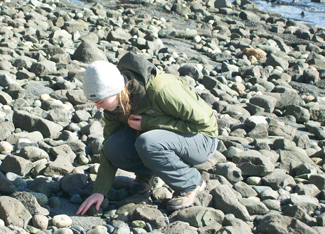 Practices such as contemplative solo time in nature, natural history observation and creative writing help the students deepen this connection. See “Spring Block” for a fuller portrait, as well as Veronica's Self-Assessment and Heather's Self-Assessment. After the intense activity of presenting two different outdoor programs with different age learners in 7 or so weeks, the students are ripe for reflection and a 'reward' (which generally proves to have its own surprising challenges). We head to the biggest and highest wilderness we can feasibly and safely get the group to in late-May/early June (some years this is actually quite low in elevation!). In yet a third 50-50 division of the group, the students prepare complete expedition plans for half their time. These groups are shadowed by pairs of interns who check in with them as needed. The other half undergo 72-hour stationary solos with enough distance to experience solitude and isolation but again with extra safety systems built in. 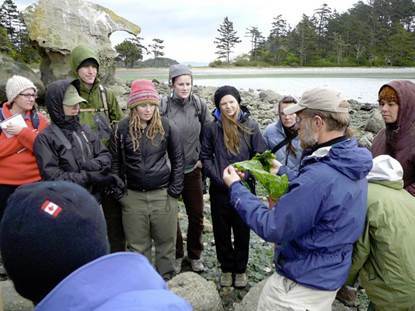 The purpose of this segment of the class is to complete our exploration of environmental education from the backyard to the backcountry by modeling institutional wilderness travel, and examining what educational purposes can be fulfilled solely in wild nature. In our urbanized and electronic society, being cut-off this long is an unusual experience, and uniquely allows a slowing down and contemplative or active centering. Perhaps primary among these opportunities is a chance to realize that beyond fears, preoccupations and distractions is an immediate and ever-present connection to our origins. And that is the ground of the kind of denizen-oriented and rigorous civic engagement I believe we need. Only by “taking our students there” can we prepare them to figure out how to do the same for the generations following them. Frederickson, B. & Branigan, C. (2005). Positive emotions broaden thought-action repertoires: Evidence for the broaden-and-build model. Cognition and Emotion, 19, 313-332. Kasser, T. (2002). The high price of materialism. Cambridge, MA: Harvard Univ. Press. Langer, E. (2009). Mindfulness versus positive evaluation. In In S. Lopez & C. R. Snyder (Eds. ), Oxford handbook of positive psychology (pp. 279-293). New York: Oxford Univ. Press. Palmer, P. and Zajonc, A. (2010). The heart of higher education: A call for renewal. San Francisco: Josse-Bass. Rockström, J., Steffen, W., Noone, K., et al. (2009). A safe operating space for humanity. Nature, 461 (24 Sept), 472-475. Seligman, M. (2011). Flourish. New York: Free Press. Steger, M. (2009). Meaning in life. In S. Lopez & C. R. Snyder (Eds. ), Oxford handbook of positive psychology (pp. 679-687). New York: Oxford Univ. Press.